This sweet little owl cake was so much fun to make. It is covered in yummy buttercream and embelished with shapes I cut from gumpaste. I have started using gum paste instead of fondant on some designs because of the humidity we have here in S.W. Arkansas. After the gum paste hardens it doesn’t tend to sag or soften under the weather. I once again used my ‘go to’ sculping medium (Rice Krispie treats… no butter) to build the owl and limb. 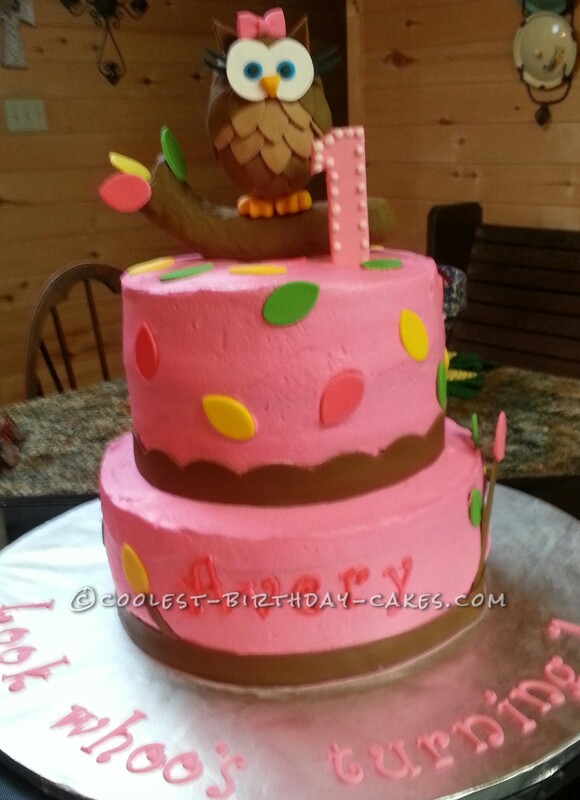 I used a small leaf fondant cutter for the tree leaves and different colored feathers on the owl. I fashioned the bow from gum paste and for the rest I just cut out gum paste shapes. Then I glued it all together with piping gel and icing and it came to life. The cake was just precious and a pleasure to work on.